The Seychelles – just the name conjures up images of golden sandy beaches, palm trees, turquoise waters, sunset cocktails and five-star beachside resorts. The islands are a luxurious enclave for honeymooners, celebrities and billionaires. So when I found a flight to South Africa which had a stopover in the Seychelles along the way, I couldn’t resist. The only problem was that my travel style’s more budget-luxury than five-star. But I was determined to see if it was possible to visit the Seychelles on a budget. 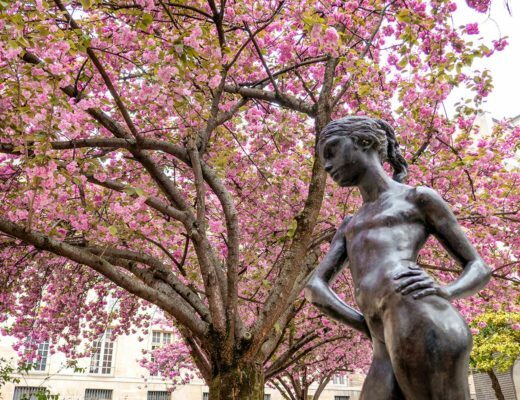 And although it’s never going to be an ultra-cheap destination, it turns out that keeping your costs down isn’t impossible, even when you’re following in the sandy footprints of A-listers and royalty. There are 115 different islands in the Seychelles archipelago, but most are uninhabited so it comes down to a choice between the three main islands as to where to stay – Mahé, Praslin and La Digue. Mahé is the largest and is home to the Seychelles’ capital Victoria and the international airport. Praslin is smaller and accessible by plane or ferry, and from there you can get the ferry to La Digue – the smallest, quietest and arguably prettiest island. The islands are fairly close together so it’s tempting to try and see them all, but travel time and costs add up, so if you only have a few days it’s best to focus on one island. Accommodation prices tend to be lower the longer you stay, so you can save money by not moving around. Mahé is the cheapest island as it’s the easiest to get to and the biggest so there’s more competition for accommodation. As we only had a four-day stopover we stuck to Mahé, but if you have a week you can easily hop between islands and try a couple of different locations. From Mahé the fast ferry to Praslin takes about an hour and costs around €94 return, or Mahé to La Digue (via Praslin) takes 90 minutes and costs around €122 return. Peak season in the Seychelles is from December to January and from June to August, which is when you’ll pay higher prices and need to book well in advance. Rainy season is from January to February, but it’s still warm and downpours are usually short. So if you don’t mind risking a shower you can save money on flights and accommodation costs. The Seychelles’ currency in the rupee (SCR or Seychellois Rupee), with around 17 rupees to the Pound, 16 to the Euro and 14 to the US Dollar. Most things have to be imported, so bring plenty of sunscreen, mosquito repellent and toiletries to avoid high imported prices. When you arrive into the airport, you need proof that you have accommodation booked, so it’s not the sort of place you can wing it and pick up a last-minute bargain room. Luxury options far outweigh the budget gems in the Seychelles, so if you want to bag the best places you need to book as far ahead as you can. Hotels tend to be expensive, so instead look out for family-run guesthouses or self-catering options like chalets, bungalows and villas. Expect to pay £70–£150 a night, depending on the location and facilities. We stayed in the one of two Fler Payanke apartments on the east coast of Mahé. 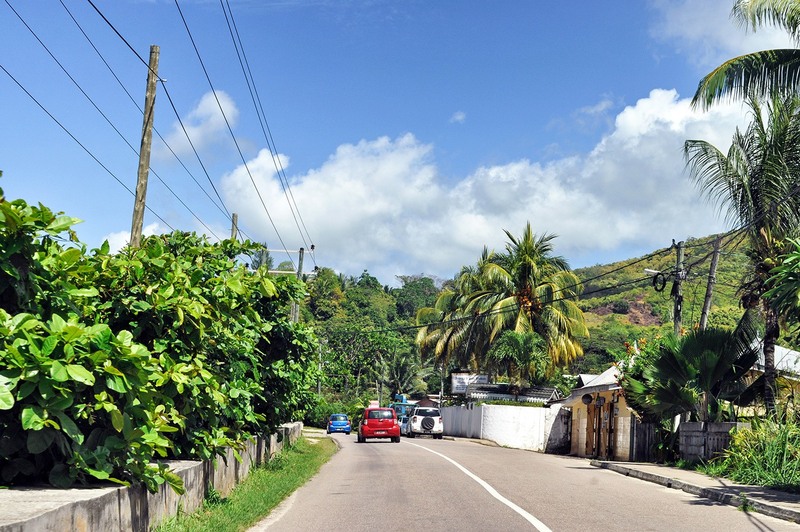 They’re set on a hill overlooking Anse Royale bay, within walking distance of a beach, bus stop and a few shops and places to eat. Our studio apartment with a balcony and kitchen cost £85 a night (including AirBnB fees). La Digue is so small that, other than a few taxis, most people get around by bike or ox cart. Mahé and Praslin are bigger so a hire car is the easiest way to explore. Car hire costs around £35 a day. Most are small automatic cars, which are slow but nimble on the windy mountain roads. Petrol costs fluctuate but we paid around 170 rupees per 10 litres of fuel on Mahé – spending a total of 370 rupees (£20) over four days after covering pretty much every road on the island. If you don’t want to hire a car, then the best option is the public buses (the mountain roads are hard going for cycling and walking can be dangerous as there aren’t a lot of pavements around). The buses cover over 40 different routes across Mahé and Praslin – we spotted them even on the smallest beach roads. They use old blue Tata minibuses and the driving can be a bit crazy so hold on tightly around the mountain road hairpin bends! A single fare costs 5 rupees (30p) and it’s easy to spot the bus stops as they’re painted on the road. 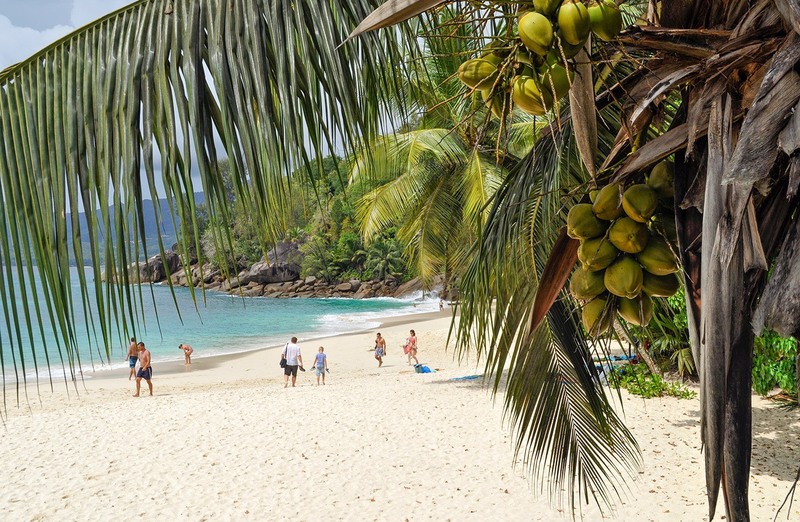 The Seychelles are all about the beaches – and they’re the islands’ best bargain. All beaches are free access, so even the ones which have five-star resorts on them are also open to the public. So you can beach-hop your way around the islands and join the jet set at the Banyan Tree resort at Anse Intendance, the MAIA resort at Anse Louis or the Four Seasons Hotel at Petite Anse. You can usually access the beach from the road so you don’t have to walk through hotel grounds. There are some off-road parking areas or otherwise you can just park on the side of the road, and the buses stop at all main beaches. Strong currents mean that some beaches aren’t safe for swimming, or are only safe at certain times of the year, so check local signs before taking a dip. 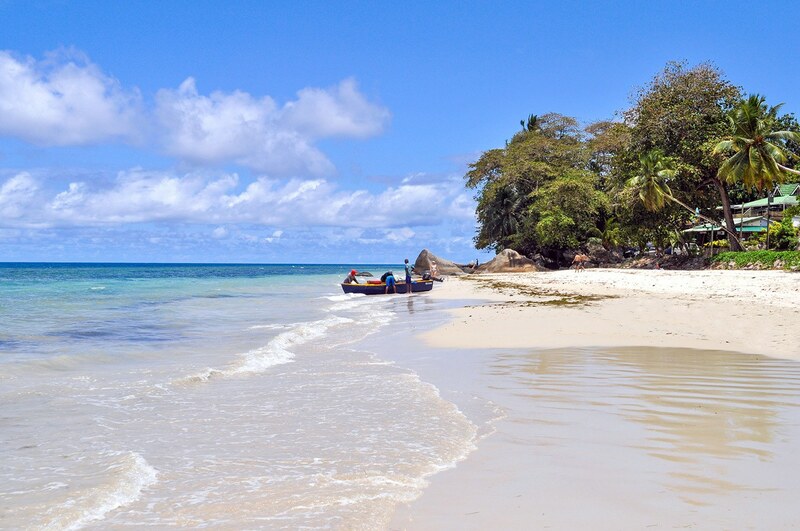 Away from the beaches there are a few other cheap or free things in the Seychelles. There are hikes along the coast or through the mountainous area in the centre of Mahé. Among the most popular walks on Mahé are the coast path from Beau Vallon to the secluded beach at Anse Major (around two hours return) or the steep climb up to Morne Blanc for amazing views out over Morne Seychellois National Park (two hours return). If the weather’s bad you can visit the Botanic Gardens (100 rupees/£5), Natural History museum (15 rupees/80p) and Hindu temple in the capital Victoria. 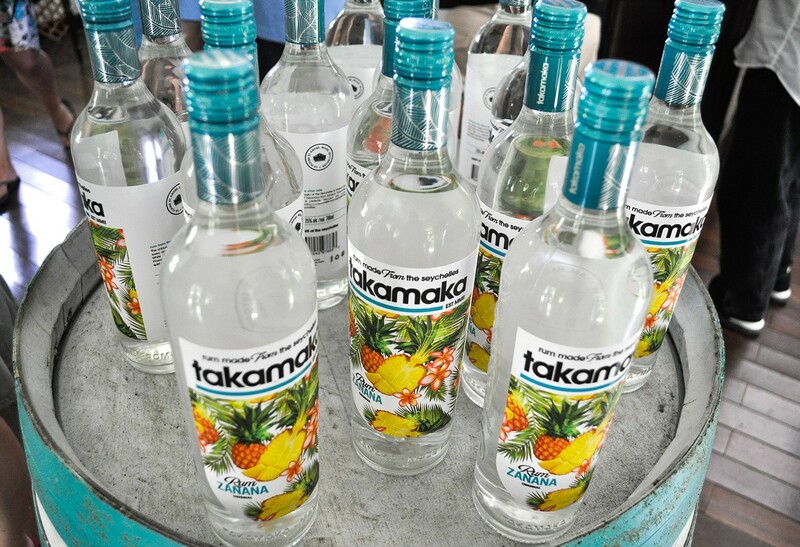 Mahé is also home to the Takamaka rum distillery which runs tours and tastings at 11.30am and 1.30pm, Monday–Friday (250 rupees/£13). And if you want to splash out (excuse the pun), you can take a snorkelling or diving trip, a boat trip to an uninhabited island or spot whale sharks between August and October. Apart from fish and a few varieties of local fruit and veg, everything else has to be imported into the Seychelles so it comes at a premium price. This means a main course in a standard restaurant will cost you around 250 rupees (£13) and at high-end resorts they can be much higher. Add in a couple of drinks and the service charge and you’re looking at at least £50 for a meal for two. One bargain in Mahé though is Beau Vallon’s Wednesday market (4pm–8pm), with freshly cooked dishes like satay, grilled fish and coconut curry. 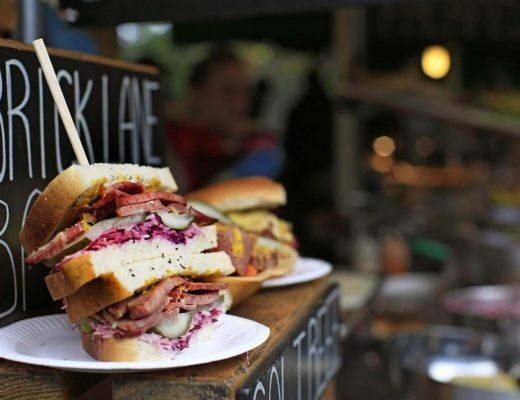 Self-catering helps keep the prices down – even if you eat out in the evenings it’s worth grabbing supplies for a lunchtime picnic. Victoria’s covered market is open every day except Sunday and sells local fruit and veg, spices and fresh fish – you’ll also see fish sold by the roadside. There are also lots of little Indian-run supermarkets around the islands where you can pick up drinks and basic food items. Or there are a couple of bigger international supermarkets in Mahé – a Co-op in the Eden Island development and a big STC on the outskirts of Victoria. Both sell a lot of imported European products (mainly from France). If you’ve got space in your bag it’s worth bringing a few food basics like pasta, cereal bars, tea and coffee to get you started, and stock up on alcohol at duty free before you arrive. You can’t bring plant or animal products into the country, but you can bring up to two litres of wine and two litres of spirits per person. Seybrew beer and Takamaka rum are both produced on the islands so their prices are lower – you’ll pay around 35 rupees (£2) for a 0.5 litre Seybrew in a local shop versus 160 rupees (£9) for a beach bar cocktail. So, can you visit the Seychelles on a budget? Well sort of! 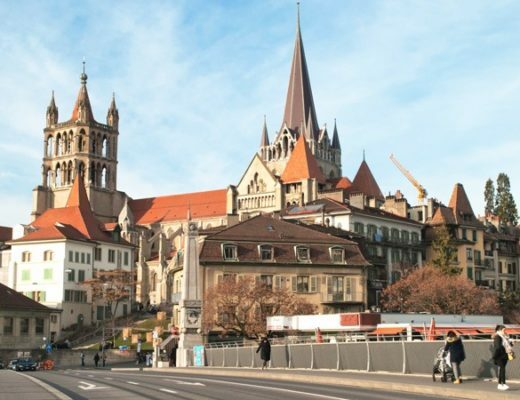 If you’re on a very tight budget you’ll struggle with the food and accommodation prices. But for around £80 a day per person you can stay in an apartment, rent a car, beach-hop and hike, cook most of your own food and have a few local drinks. It’s very easy to spend a lot more though, so it’s a destination where you need to always keep one eye on the budget – but it’s worth it for a taste of Indian Ocean paradise. Looking for somewhere to stay in the Seychelles? It looks like it is possible! I can imagine this appeals for people spending longer on the islands too – a few fancy nights but also some privacy and quiet time self catering too, we often find that mix works well and prices well! 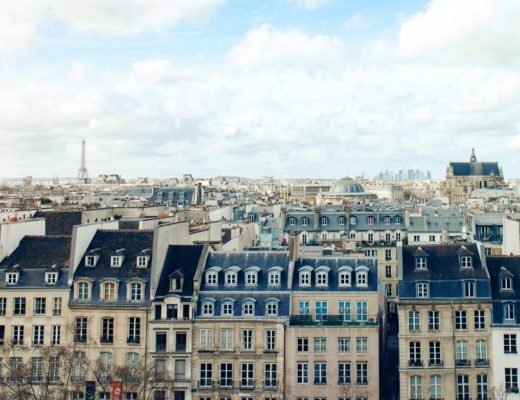 That’s a great idea – I’m a bit fan of the budget trip with a bit of luxury thrown in (though tend to do it more in cheaper places where you can get somewhere really special for your money!). Hi, I would try AirBnB and search for ‘Home type’ as ‘Private room’ then they should come up. Another wonderfully detailed post by you lovely Luce. Very useful info – and your pics are incredible, as always. Thanks so much lovely! I struggled to find much info when I was planning the trip so wanted to go and check out as many things as possible while I was there so I could write it up (all those beach days were clearly a hardship!). 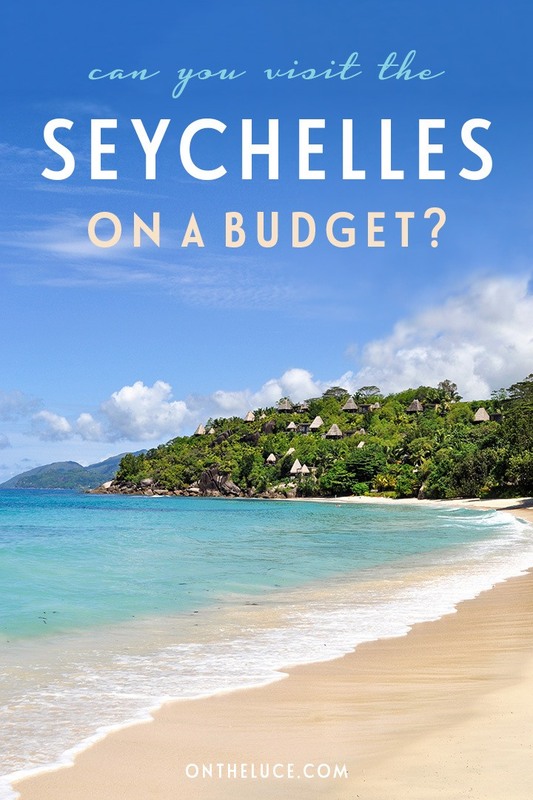 This is great – I had no idea the Seychelles could be done at a fairly reasonable price! It wasn’t the easiest budget trip (I had to pretend I’d forgotten the exchange rate to properly enjoy my pina colada on the beach!) but definitely worth it. I’ve stayed at Fler Payanke apartment too! 🙂 I agree with you! It’s not the cheapest destination on the planet, but if you plan your trip well in advance and keep an eye on your budget, you can travel to Seychelles for reasonable price. How funny! It’s a lovely spot – I spent lots of evenings on the balcony there (we had some cracking thunderstorms and sat and watched the lightening over the ocean). Couchsurfing is a great idea if you’re on a tight budget – especially for solo travellers as it can get expensive booking apartments on your own. I’m so happy to read your post. The Seychelles are one of the spots I’m considering for a big anniversary we have next year and I want to surprise my husband. All I was seeing was $$$$ so it’s good to hear you can have an experience there without breaking the bank! Thanks. What great timing! It would be a lovely spot for an anniversary – especially one of the smaller islands. Hope the post comes in useful. I really love you soo much for this post. There is enough information for a budget traveler. I have already bookmarked it. amazing photos. You’re very welcome! Hope it comes in useful. Hope you get to see it for yourself one day! This is one of the things I love so much about your posts, Lucy – the thoughtful tips and advice. I’d never looked into how much of the produce in the Seychelles is imported, so your suggestions on bringing your own basics are very handy – being pragmatic brings the seemingly unattainable destinations within reach! Thanks Sara, I didn’t know a lot about the Seychelles really until we booked the trip so needed to do a bit of research and thought it might come in handy to other people too! I love your attitude, it’s exactly what I would do, in fact I think we both consider it a challenge when something like this comes up to prove that it can be done – especially when it is a free stopover it’s impossible to refuse! I’m not surprised that self-catering plays a big role in keeping the budget down too. I’m such a big self-catering fan as you have so many more options (plus I can’t eat gluten so it’s good to have a back up if I struggle finding somewhere with something I can eat!). What a great and useful post Lucy! Definitely one I’ll be keeping bookmarked if I ever go to the Seychelles which hopefully I will because it sounds like my perfect destination. Beautiful beaches and rum? Yes please! 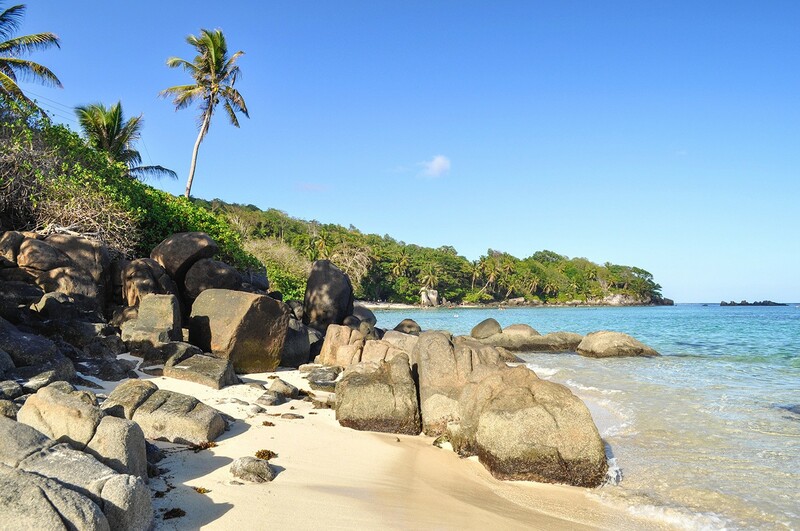 Thanks Emma – if you like rum and beaches you will definitely like the Seychelles! 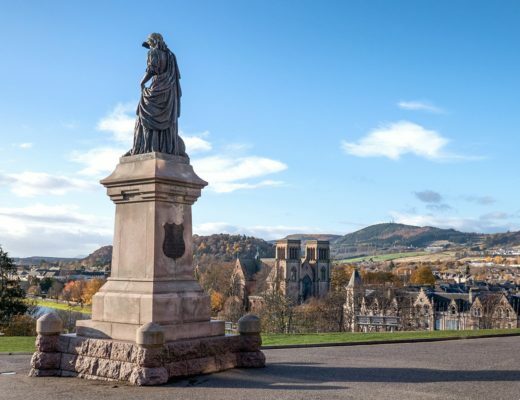 Stopovers are such a good idea! I love that you made what could have been a very expensive four days fit nicely into your budget. Heaps of useful info here and as always I love your photography. Thanks, I had some pretty good subjects to photograph! Stopovers are so good to add an extra trip in, I’ll definitely keep my eye out for future possibilities. Brilliant post Lucy. 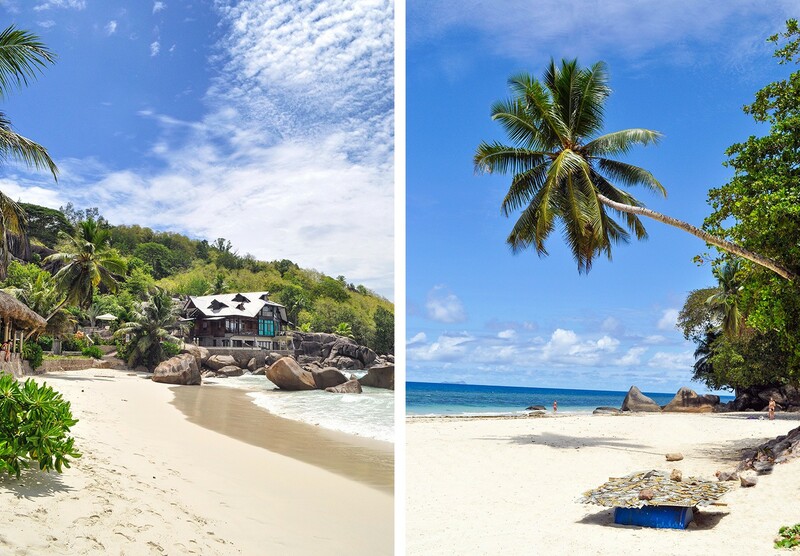 Lovely photos and I would never have thought of AirBnB in the Seychelles. Such a good idea if you are on a budget, especially as it means you don’t have to eat out all the time. Now I just need to see if my airmiles can get me there! Thank you! I’m finding AirBnB more and more useful for the less expected places as they get more listings added and the choice goes up. Being able to cook some of your own food really helps stick to a budget. 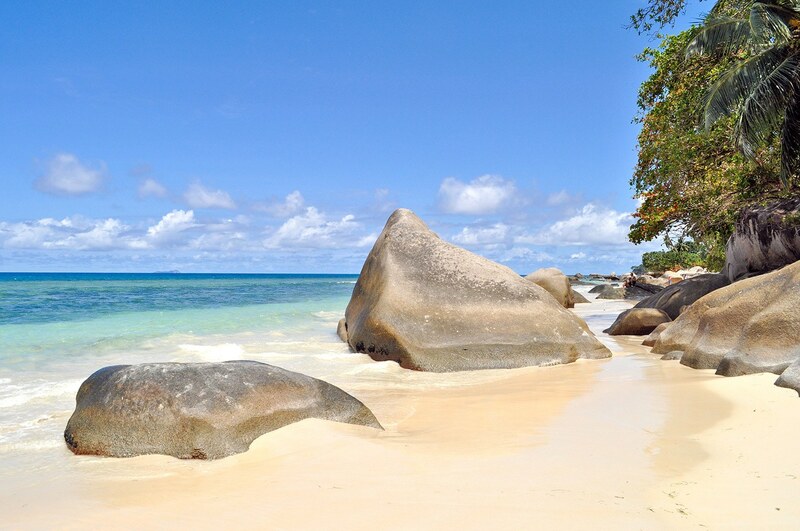 Seychelles looks amazing! I think £80 a day isn’t that bad. Thanks – we did keep a close eye on our spending but were pleasantly surprised that it wasn’t a complete mission impossible! I had never thought of AirBNB in somewhere like the Seychelles – that is such a great way to see the islands. I think I’d always assumed it was 5* only too. Great tips about the food as well and at £80 per day, I suspect your 4 days was still less than one night in a hotel! I saw someone do a similar thing with AirBnB in the Maldives and it was a really good way to make a pricey destination more affordable (I dread to think what the resort prices are like!). Oh my I fell in love with this place just looking at the pictures. Never thought that it is possible to get some budget trip here, but will surely try. Thank you Lucy for this wonderful info. 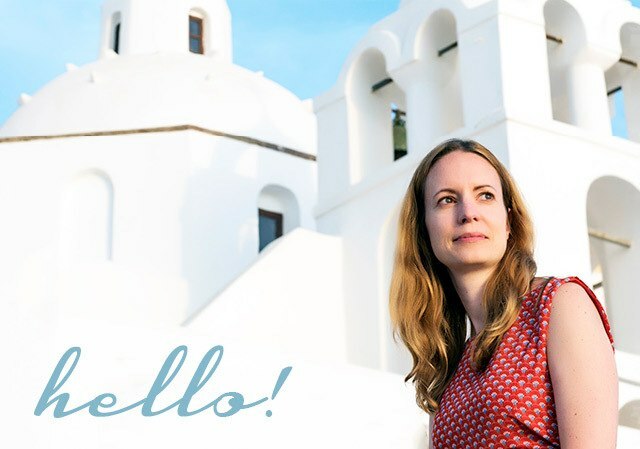 You’re very welcome – it is a stunning place, hope you get to visit someday! Hi Lucy, thanks for the very helpful post. :) Looking forward to have a vacation there someday. Which month did you visit there? Thanks Sadia – we were there in early November so had a few showers but it wasn’t quite into peak season prices. Hope it comes in useful! I just want to Thank you for the wonderful insight into a once believed unobtainable dream destination. I never ever would of thought of using AirBNB to reduce the cost in such a place. I am now looking into making this dream a reality for our up and coming 25th wedding anniversary. With all of your tips and realistic advice I feel that we can do this now. I will let you know how we make out. Thanks Alisa, that’s great to hear! Really hope it all works out for you and you have a fantastic 25th anniversary – do let me know how you get on too. Thanks a lot for valuable information, Im doing a solo next month for 10days, I’m now able to plan my trip more better and cheaper, thanks to you. Cheers! That’s great to hear – hope you have a wonderful trip! Hi Lucy, Is the weather is good in December and January? Is there any rain? Hi Raisa, January has the highest rainfall (around 380mm on average) and December is a bit lower (280mm), but it tends to be drier in the north and south sides of the island. There’s on average around 18 rainy days in those months but it’s often stormy so it’s just raining for part of the day. We went in mid-November and had heavy rainstorms in the evening but a mix of sun and clouds during the day. Thanks a lot Lucy. So its better to plan to get the sunshine and clear sky at October. right? Yes hopefully the rainfall should be a lot lower then so you should get some clearer days. I will follow your blog from now on since I love traveling so much but also to spend my money properly, so i appropriate your article very much. Also, where do you get a reliable information about the whether? I plan trip to Seychelles on October , i really hope it will be nice and warm. Thanks! 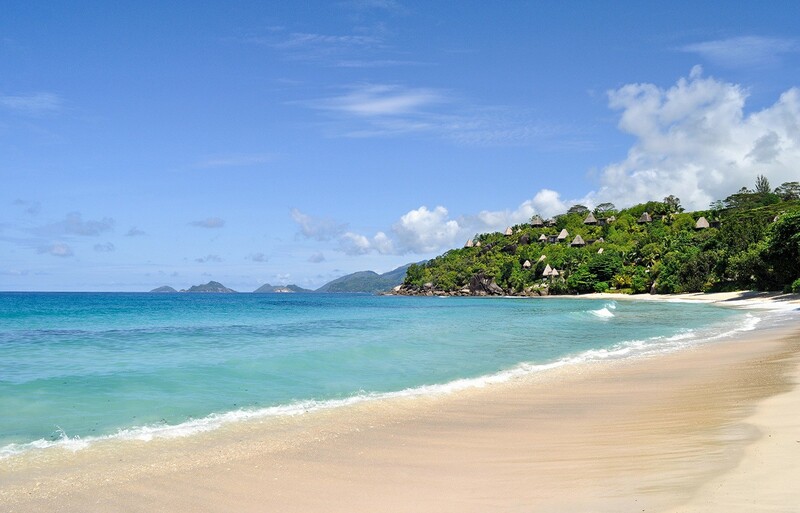 October in the Seychelles is warm at 24°C at night up to 30°C by day – there may be some storms and showers, but they are usually fairy short lasting. Thanks Lucy for such a wonderful information. I am planning my honeymoon there Feb 2019. Hope you have a wonderful trip (and congratulations!). So glad it was useful! February should be around 28°C and maybe a few showers but they’re usually quite short.